Glass Aquarium Tank: 10gal for one to two geckos. Larger tanks to house more, such as 15-20gal for three or four and so on. 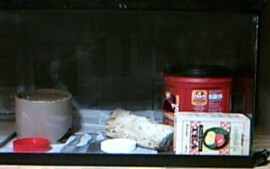 A Screen Top Lid: For leopard geckos, a glass or enclosing lid is not needed, nor suggested as they would raise the humidity too high. Hygrometer and Thermometer: To monitor heat for the bottom of the tank, and humidity for the side of the tank. Hides or Caves: At least 2 for one to two geckos, one for cool end and one for warm end. Substrate Box: Including a moist humus/coir like peat moss for humidity to help them shed, cool or even lay eggs. Under the Tank Heater: Looks like a thin pad which should fit under only one half side of the tank. This includes whether or not you'll decide to use a heating light. Lights: I don't recommend heat lights for smaller tanks like 10gal. At best, you'd only need a 15W incandescent, which is fine for any size tank to be able to shed some light on the subject without really disturbing the gecko. Water Bowl: A dish or reptile water reservoir is fine. Calcium Dish: A small, shallow dish to place powdered calcium that does not contain Vit D3 as a constant supplement. They like to lick it or even scratch it around and lay in it. Supplements: For reptiles, powder form of vitamins, and powder form of calcium with Vit D3. You'll be coating their crickets in it. Accessories: Things like sandstone slate or 'Rep-tiles', large/fat grape vine(s) to lay on or climb for basking and/or cooling. 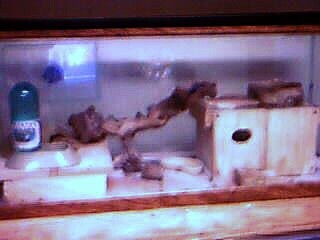 This is the set up I've made for my leopard geckos, housing 4 in a 20gal or better tank with a screen top cover. I made them a bookshelf platform on the very left end. They chose the bottom half as their pooping place and the top half holds a hide and their water bowl. On the far right I made their substrate box with plexiglass inside and 1' ply board on the outside. I got tired of my substrate boxes not doing what I wanted them to in the tupperware department. Now that it gets moist enough though, I've gotten it too moist for eggs so I'm still trial and error on how much humidity should be in the substrate. I'm using straight peat moss and/or coco-peat. You're supposed to have the moisture in the substrate where if you squeeze it, it won't drain or drip. I think I need to add a couple of holes to the plexiglass lid I made for the box, so the moisture won't collect on the top of the lid and drip back down. For the tank bottom itself as substrate, I'm using straight news paper lightly sprayed with 'Provent-A-Mite'. Adding a bit of a grape vine, sandstone slates to lay on and a bowl for calcium without Vit-D3, they've been very content with their environment enough to get along and even breed. I don't use any form of lighting but an under the tank heater on one side 24/7. They don't seem to have cared for lights anyway and the night ones just dry out my substrate box that much faster. I do use a 15W incandescent or optional cool fluorescent on a day time timer for all the gecko tanks, just to have an ultra subtle lighting for myself they can escape from, and it does help in making their coloration a little lighter. Leopard Gecko's can be kept in a ten gallon tank just as easily but you don't want to house more than two. The more you decide to keep together the more room they should have. Never house two males in the same tank as it will cause them far too much stress with competition and possible fighting. At times even females will compete with each other for space, so if you have a female being particularly aggressive with the others, they should be given their own tank. Gecko's don't necessarily require company and can live just as well alone. Have the tank ready before you buy your gecko, assuring the right temperature and a comfortable environment before the gecko ever arrives. 40-70% humidity. 80-90 day temperature with a drop at night to 70-75%. With a thermometer and hygrometer the temp can be monitored. It is maintainable with an under the tank heater placed between the table and tank rather than inside the tank itself, on only one half side of the tank. Using newspaper and sandstone slates, I don't have to worry about the bottom getting too hot for my geckos. I also have the elevated places where they can simply move up, or move to the side that doesn't have the heat pad. Optionally I can put the tank heater on a timer to turn off at night but with a tank as large as mine it really hasn't been needed. As far as lighting such as heat lights, I haven't liked them. For a ten gallon tank I wouldn't even recommend it since you'd need 20wat or even less to maintain 90 degrees. Also lights aren't very generalized, heating up pretty much the whole tank. Some people prefer them because the geckos require vitamin D3 supplement to help them digest that incandescents can provide, but powdering and gut-loading their crickets has worked just as well for mine. Most lights seem to bother them enough to stay hidden from light with mine, so I think it's just a matter of your own opinion as you research and experiment for yourself. I think as long as you can maintain the temp, humidity and supplement and the gecko's comfortable, you can't really go wrong in how you go about it. I use plain news paper just because it's highly low maintenance. One extra fold in the poop spot usually takes care of cleaning up their mess. Other options are things like repti-sand or even humus or coir like peat moss, coco-peat or eco-earth. There are also some repti-carpets and compressed cork flats. The things you have to consider though are roughage and consumption. A carpet meant for iquana's wouldn't work for a gecko as it would be more like a bed of nails for them. Their skin is very delicate, like other things to look out for that have sharp edges, it could even cut off their toes. With granular substrates like sands and peats, they are very likely to ingest it which may cause their digestive tract to become impacted. I've heard some people prefer repti-sands because they add calcium to it, which is more natural to their native environment and eating sand to gather their calcium. I just give my geckos a very large helping of plain calcium powder. Especially Fancy Dance likes to dig it out of its bowl and just get it virtually all over the tank and lay in it. If I went with sand though I would choose 'Zoo Med, Vita-Sand', it has vit and cal additives but particularly because it is ultra fine and once it's in there, you can't exactly tell your reptile not to consume too much of it. For most of these reasons I went with just plain news paper, easy to get, replenish and cheap. I added a few large pieces of sandstone slate but 'Rep-Tiles' would work well too. The slate has the potential of sharp edges but that can be sandpapered, it stays warm for a long time like any stone to bask on and gives them a smooth-roughness they can rub against when they're shedding. Plus, I can just take them out and wash them in warm soapy water. Roughness and sharpnesss in rock and wood materials is important to look out for. Both should be flat and/or smooth like a regular stone or a knarl of wood stripped of its bark, but not have sharp edges or points you couldn't sand paper smooth. Never use porous rocks like lava rock. A Leo can rub against a lava rock and end up shaving off more of themselves than they meant to. You try walking on the stuff barefoot. Never use cedar or pine as dust, chips or shavings as a substrate. Cedar or pine logs, driftwood and so fourth are safe pending on how much they still retain their sap or resin (smell). It is irritating to the skin, particularly the smell can be toxic and cause lung and nasal infections. The safest side would be to just go for the grape vines. I did use cheap pine in my building materials for that 20gal tank but they were untreated, 'dry' boards with no resin or pine smell left to them. Cedar or pine as shavings are far too high a toxic smell as well as having sharp edges. I wouldn't use the stuff on a gerbil. I think cedar bedding is better off in a ziplock bag full of holes to replace mothballs in my closet. Another particular to look out for is heat rocks. You plug them in and set them inside. Unfortunately, they get too hot. They will kill crickets for sure but also have the possibility of burning the gecko. I've also never liked or used vermiculite because it sticks to animals, looks metallic, turns to mush, and contains asbestos. Some folks have no problem with vermiculite though for such as the substrate box or to incubate eggs. On the side of the under the tank heater is the best spot to place the substrate box. This can be a tupperware with a hole in one side large enough for a gecko to scramble in, with a lid on top, they'll go up there and bask. Inside the box should be moist substrate like peat moss, coco-peat or eco-earth with the option of adding perlite. These types of humus are best for retaining moisture without the unwanted mold. If it does gather mold it should be white, harmless mold you can simply spray with a spray bottle. After that it shouldn't return. For the most part I just get the humus to the moisture I want and then store it away in a large plastic coffee container for the next change out, when I open it up it's already moist and warm and far less likely to white mold in the substrate box. The substrate box allows the gecko the moisture they need to help them shed and they might choose it to lay their eggs in, if any. It will also provide the entire tank the low level of humidity it needs. Occasionally spraying the tank with a water bottle will help maintain the humidity as well but you might not need to do that with a ten gallon tank. In my larger tank I mist the gecko tank once or twice when they're molting for a higher humidity than norm to help them shed. Loose crickets also like the substrate box and may even lay their own eggs in it. I've never found any harm in this except when my gecko may have laid one or some of her eggs in there and the crickets or too much humidity got to it before I could. I don't really have a solution for this but perhaps move out any geckos that are still eating when you notice she's pregnant, leave her alone, and make sure the substrate is nearest to very lightly damp. Geckos need places to hide and don't intentionally care to share it. The more geckos you have in a tank, basically, the more hides you need. These are anywhere from a toilet paper roll, a coconut shell, to any dome of some sort with a hole in it, or even platforms like the one I made for the larger tank pictured above. Even in a ten gallon with just one gecko, you need at least one hide on the 'cool end' and one hide on the warmer end with the substrate box. This way the gecko can move from one side to the other and choose whether they'd like to be enclosed in a nice dark spot or sit out and bask around. They also need a water bottle which they will occasionally wander by and take a couple of sips out of. The best type of watering I've found is a reptile water container that has a bowl with a resivoir bottle and a cricket mesh between them so crickets can't get sucked up into the water bottle. The biggest problem with water bowls in general is crickets will drown in them without a rock or something placed in the bowl for them. Plus, geckos don't really drink a whole lot, but should have a fair amount of fresh water available to them at all times. Pretty much any accessory after that is all yours to decide. I've never done well with keeping a live plant that wouldn't potentially poke or abrase a gecko much less raise the humidity too high or just die for lack of its own needed conditions but I've still managed to make a not-so-shabby scenery on the eye thinking about the geckos first. Things like a large bit of grape vine is good for them. Pre-sand it to get any unwanted rough stuff off of it, they aren't really much of climbers so make it pretty easy for them to scramble on. 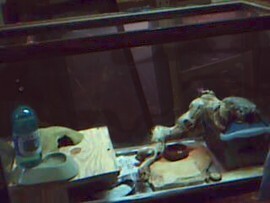 They'll use it to bask, climb, hide and rub themselves when molting. Just make sure any climbing or structure materials are sturdy and wouldn't fall down with a gecko scrambling over it. The tank should be cleaned once a month or so. Not really by too much longer, especially with loose crickets and stray poop. I have more details in 'general care' on the feeding and crickets in this repeat. I try to clean up poop with an extra fold of newspaper in their 'mostly' designated place to go, about every other day. The largest problem is crickets can eat the poop and then the gecko eat the cricket, cycling a digestive parasite bad for the gecko. If there are any crickets left while cleaning, they get chunked too, but everything's going to my compost in the backyard, so no great loss on crickets. Wash your own hands because the poop is mainly where human contamination for salmonella from reptiles comes in. I wash my hands after everything, from feeding to handling, with a regular squirt bottle of germ-x hand-sanitizer. It doesn't take 15min to clean a tank but I wait for the month because it's a big change for the geckos in having to move out and then move back in to all these new and missing smells. Every once in a while they might even change the place they decide to poop at, just for the lack of the old familiar smells. It's really best to have no crickets left after a feeding (every two to three days) but sometimes someone isn't eating their share for one reason or another like molting, pregnant or over stressed. Crickets are also like homing devices for the best nooks and crannies to go hide while the free for all is going on. Basically, if you have live food, you have unavoidable escapee's and it's better to just leave them than stress geckos out catching what they didn't eat by the next day. I move hides and things around by the next day just to get crickets to flee, and that tends to help some with having extras. The gecko's know what's going on and get pretty keen on it. Also, leave the extra crickets a half of a potato in an open spot where the geckos might get a chance to catch them while they're eating on the potato. At last, if it really is just too many, harboring the potential to nibble on the geckos themselves, clean the whole durn tank and toss the crickets. In the general monthly cleaning, once everything has been removed from the tank and the geckos placed elsewhere with one of their hides, wipe the tank out. Some folks suggest things like bleach water but I really think these kinds of chemicals are too harsh and I have to wait too long for it all to dry out and fan it to get the smell out of the tank for clean air. If I don't use just warm water and a wash cloth, I prefer this organic, 'Natural Chemistry' - 'Healthy Habitat' spray bottle that uses natural enzymes to break down odors and stains. In my opinion and from using it, it's just as effective as the bleach water and a hell of allot safer and more convenient to use and inexpensive. I lightly spray both sides of a fold of newspaper with 'Provent-A-Mite'. Let it air out for a minute and then place in the tank. Tiny mites can be as much a problem for a gecko as anything else like intestinal parasites. Wash accessories in warm soapy water, or the 'Healthy Habitat', rinse, dry and place back. 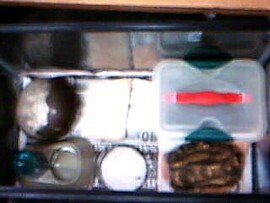 Usually the substrate box doesn't need a thing but check the humus for moisture, bits of gecko skin and general mold. You don't really need to dump the humus for a fresh batch for at least three months if things are fine.